This illumination showed up in my medievalist Twitter feed today and I tracked it back to the so-called Mettener Regel (1414), a manuscript of the rule of Saint Benedict as practiced at the Abbey of Metten. The manuscript is illustrated by moments in the life of St. Benedict. Those garments of which he is divested shall be placed in the wardrobe, there to be kept, so that if, perchance, he should ever be persuaded by the devil to leave the monastery (which God forbid), he may be stripped of the monastic habit and cast forth. That doesn’t fit, however, since the figure seems to be Benedict himself. That’s when I recalled the grand collection of fascinating stuff that is the Dialogues of Pope St. Gregory the Great. Book 2 is Gregory’s Life of Benedict, which includes this passage. One day, while the saint was alone, the Tempter came in the form of a little blackbird, which began to flutter in front of his face. It kept so close that he could easily have caught it in his hand. Instead, he made the sign of the cross and the bird flew away. The moment it left, he was seized with an unusually violent temptation. The evil spirit recalled to his mind a woman he had once seen, and before he realized it his emotions were carrying him away. Almost overcome in the struggle, he was on the point of abandoning the lonely wilderness, when suddenly with the help of God’s grace he came to himself. He then noticed a thick patch of nettles and briers next to him. 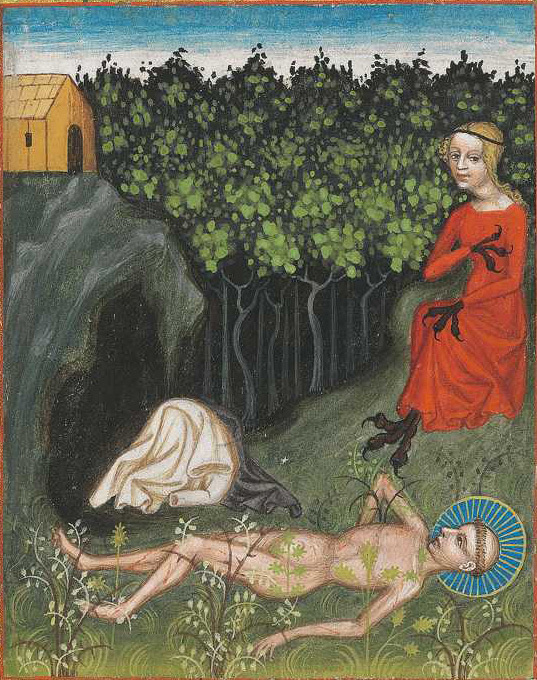 Throwing his garment aside he flung himself into the sharp thorns and stinging nettles. There he rolled and tossed until his whole body was in pain and covered with blood. Yet, once he had conquered pleasure through suffering, his torn and bleeding skin served to drain the poison of temptation from his body. Before long, the pain that was burning his whole body had put out the fires of evil in his heart. It was by exchanging these two fires that he gained the victory over sin. So complete was his triumph that from then on, as he later told his disciples, he never experienced another temptation of this kind. Soon after, many forsook the world to place themselves under his guidance, for now that he was free from these temptations he was ready to instruct others in the practice of virtue. That is why Moses commanded the Levites to begin their service when they were twenty-five years old or more and to become guardians of the sacred vessels only at the age of fifty. Thus, the picture shows the devil as both the beautiful tempting women Benedict remembered, and as the blackbird, merged into a horrible chimera to reveal the evil lurking below the surface of even the most pleasing temptation.